I mean no disrespect to my colleagues at The Stranger, but Pacific Northwest Ballet principal dancer Noelani Pantastico deserved to win your 2016 Genius Award for performance. Is she the edgy type of artist who usually gets your attention? Well, no. But she’s a performer who can infuse even the most pedestrian of roles with real grace and authenticity. For those of you who haven’t seen this particular version of the holiday classic, Dewdrop comes in to lead a bevy of Flowers in the lyrical Waltz of the Flowers. 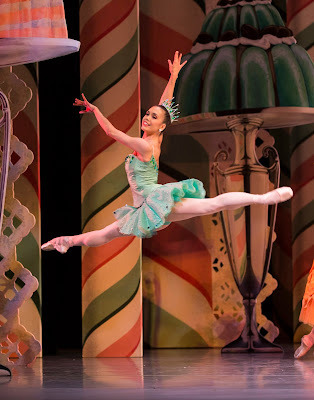 In PNB's production, Dewdrop wears a bright green tutu to contrast with the marigolds behind her onstage. The role requires technical ability, stamina and a twinkly presence on stage. Pantastico delivered those in spades, but more than that, she put her emphatic personal stamp on Dewdrop. This seasoned performer managed to isolate particular gestures; to my eye they appeared almost in syncopation to the Tchaikovsky score. I marveled at her ability to embody both the music and the character in ways that transcended the traditional performance. Pantastico wasn’t performing the role of Dewdrop; she was Dewdrop. That shouldn’t have felt so remarkable. If you haven’t seen Pantastico in Jean Christophe Maillot’s “Romeo et Juliette,” get thee to McCaw Hall the next time PNB presents this great ballet. When the company premiered the work in 2008, Pantastico and retired PNB principal dancer Carla Korbes were set to alternate in the role of Juliette. Korbes injured herself, so Pantastico danced all 8 performances. She was so amazing that Maillot stole her away from Seattle to dance for his Ballets de Monte Carlo. She returned last autumn to finish her career at PNB. Noelani Pantastico and James Moore in Jean Christophe Maillot's "Romeo et Juliette"
Pantastico probably danced Juliette dozens of times during her tenure with Maillot, but when she and PNB Romeo James Moore performed the tragic story last winter in Seattle, they electrified the audience. Truly, we were on the edge of our seats. Those star-crossed lovers had chemistry and heat! In February, PNB debuts Maillot’s version of Cinderella, “Cendrillon.” While the story doesn’t carry the dramatic heft of a Shakespearean tragedy, I hope Pantastico will be featured in a dance she no doubt performed during her tenure with its choreographer. But you don’t have to wait until next year to see Pantastico shine onstage. 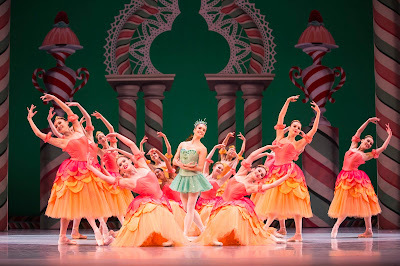 She’s scheduled to perform the role of Sugar Plum Fairy with James Moore as her Cavalier this Saturday evening, December 3rd, at McCaw Hall. Surely they can’t be as steamy in a G-rated ballet as they were onstage in “Romeo et Juliette.” Or can they? YES! All hail Noelani -- she is so amazing.